Article written by: Tanya Johnson – owner of Reedpros.com Please use the contact me form to get in touch with me. 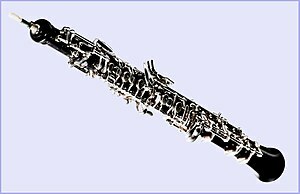 There are so many things to consider before going out and purchasing an oboe: What grade are you in school? Is this instrument your step up because you are going to college? Will you be majoring in music? Is this your primary instrument of study? Should you get a new instrument or used? What brand should you buy? Should you buy a student, modified conservatory or full conservatory model? Should you buy from Ebay, Craigslist or Amazon? I hope to help you answer all these questions and more, so read on! 1. Where should I buy my next oboe? The best place is an Oboe / Double Reed Specialist shop. The people working at these shops are small business owners who are likely active professional oboists in their local community (not always, but much more likely). If the company isn’t in the state you are in, don’t worry! You can still try out the oboe (or even a few oboes). They will ship the horns to you carefully packaged and give you specific details on what to do if you choose to keep the horn or not. Whether you are purchasing a new or used oboe, as a general rule, I would NOT recommend purchasing an instrument on Ebay, Craigslist or Amazon. Generally speaking, someone selling an oboe on Ebay or Craigslist is going to be a private owner who has one horn they no longer need and might not know very much about it. My biggest concern is that you, as the buyer, don’t know if it was looked over buy a qualified repair person and it is often a final sale. So you are purchasing as is. If you have the ability to return the instrument should you be unhappy, then that is reasonable. If you are going to buy on Craigslist, Ebay, or Amazon, just read all the fine print to see what restocking fees there might be or any other penalties. However, I would really recommend buying an oboe from a Double Reed specialty store. They are truly knowledgeable about the instruments, the different models and their specifications, and can answer your questions. I have my favorite shops and know several of the company owners personally. I would be happy to send you a few recommendations via email or phone. 2. Have a qualified instructor play the oboes you are considering and inspect them for problems. This is very important. It is crucial for a used oboe but also important for a brand new instrument. A new instrument can have defects and problems that may make that one particular instrument a poor choice. Your private oboe instructor is a great place to start. If you aren’t taking private oboe lessons with a qualified instructor, you should still have your prospective oboe checked out. Not sure if the instructor is qualified? Ask where they went to school, what they received their degree in, is oboe their primary instrument, do they currently play? It can be hard to find an instructor who is very proficient on the oboe depending on the area you live in. If you live in a rural area, you may have to drive a far distance to meet up with a qualified oboist. To search for a qualified oboist, contact the colleges and universities in your state and ask if they have an oboe instructor/professor. They may be able to play test the instrument and offer advice. If they aren’t able to offer assistance, ask them for other suggestions. You could also call your local professional symphony office and ask them for information about their oboists, then contact the oboe players directly. I have been stressing “qualified oboist” so let me explain. I have had several students over the years come to me to take lessons after having taken lessons at some retail giant music store. Upon asking my new student about their previous lessons, it turns out their private oboe teacher actually played a completely different instrument and didn’t even own an oboe! That is an example of an unqualified individual. I have also come across many “Find-A-Teacher” websites listing instructors. Many of the teachers will list guitar, piano, violin, cello, trumpet, trombone, flute, clarinet, oboe and many other instruments all taught by the same person. Now that doesn’t mean that individual can’t play those instruments, but that also doesn’t mean they are the right person to test your instrument to determine if it is one that could take you through college as an oboe major. 3. What brand and type of oboe should you buy? Here are some brands and model selections based on level. This list is not comprehensive and there are oboe brands not mentioned here. That is because I have not tried many of the other brands enough to get a feel for how those instruments “tend” to be. 5. Should I buy a new or used oboe? A used oboe can be a great way to save some money on your costly investment. Find out if you are offered any warranty and what it might cover. Even used oboes may have a warranty! If the seller says it is a “final sale, no refunds or exchanges” – beware. Should there be anything wrong with the instrument, you either have to pay to hopefully repair the issue (which could be very costly) or deal with a less than ideal instrument. If purchasing a used wooden oboe, ask if there have been any cracks and what repair person did the work. With a new instrument comes a complete warranty, all manufacturer intended accessories (like reed case, plastic instrument stand, case cover, etc) but it also comes with a new instrument price tag. Being a brand new oboe, it hasn’t cracked yet, but you will have to break it in carefully. Hopefully this article will help you in your adventures in purchasing an oboe! Happy Practicing! Don’t forget your music supplies when preparing for Back To School. Save 10% off ALL items at www.reedpros.com when you PHONE IN your order and pay via credit / debit card. Save an additional 15% off tuners and metronomes. Just mention you saw this ad when calling 818-850-0581 for savings. Offer good August 1st through August 31st, 2014. 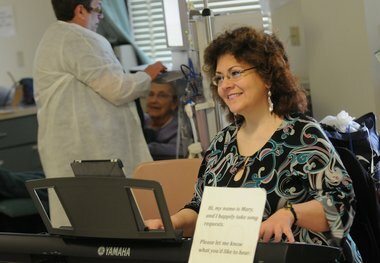 Helping Patients Through Music — video available with this link. For a moment, Beverly could forget why she was there. It was a January morning, during the worst of this month’s bitter cold. While a heavy snow covered the parking lot, the waiting room at Hematology Oncology Associates in East Syracuse was crowded with cancer patients awaiting chemotherapy. Among them was Beverly, of Baldwinsville. She sat with her husband Jim: “My rock,” she called him. They have three children and eight grandchildren, and Beverly was thinking of how one of her little grandsons, over the yuletide, turned toward her after she told him she loved him. Every day. Those words help keep her going. Beverly is a survivor of breast cancer, then cancer of the thyroid, and now she is battling lymphoma. She was in a good mood on this particular morning, but she shared no illusions about the treatment — “I wouldn’t be human if I didn’t have my bad days” — and she said the waiting room, in itself, is a kind of crucible. She’s 73. She can balance her cancer against the joy, the family accomplishments, of many years. What’s hardest, she said, is when she sees young people coming in for chemotherapy. She grieves for what they are facing, all too early. In those moments, she is grateful for the music. Andrew, a graduate student, sometimes plays with Symphoria, a nonprofit organization of about 50 musicians from the old Syracuse Symphony Orchestra. Trombone is really Andrew’s primary instrument, but he enjoys the chance to sit with the piano. Patients, moved by a particular song, occasionally slide in next to him, on the bench, to offer a memory or two as he plays. He was part of an initiative known as Healing Harmonies, established by Symphoria with the support of the Alive! Foundation. Musicians, who are paid a small stipend for their time, also perform in the St. Joseph’s Dialysis facility at Northeast Medical Center, in Fayetteville, and there are plans to expand to other medical venues. The program was founded by Victoria Krukowski, a member of Symphoria. Two years ago today, she lost her mother,Marian Bullock, to complications related to Alzheimer’s disease. Marian loved music. As the Alzheimer’s worsened, Victoria often played clarinet for her mom. When Marian died, Victoria wanted to honor her mother in a way that would have lasting significance. She remembered how a friend with the Pittsburgh Symphony Orchestra once told her about the healing ripple of music on those struggling with illness. In that way, “Healing Harmonies” was born. It became a regular feature at the dialysis center after Victoria met Dottie Clark, 80, a retired music teacher who is there three times a week, for four hours of dialysis — a treatment that replicates the work of healthy kidneys. Dottie speaks of her fellow patients as a family, and she told Victoria that her friends would embrace the presence of music. Dialysis is a hard and draining process. One of Dottie’s arms, until she’s finished, is always attached to a machine. Mary Sugar, also of Symphoria, set up nearby on a recent morning to play keyboards. Mary spent years in New York City. She has performed with many renowned musicians. She was in the orchestra for several Broadway productions. She took part in concerts and shows at Kennedy Center. None of it, she said, means as much to her as the dialysis center, where she puts up a little sign that says she takes requests. Mary played Always as a gesture to both Dottie and Carole Verne, a Chittenango resident whose kidneys “started to go” after heart surgery in the 1990s. Carole, 75, is also dealing with multiple myleoma. Dialysis, she said, can wear her out, and there are days when she would rather not face it. Then she thinks about her children and grandchildren, “wonderful kids who mean so much to me,” she said. She shows up. The music is a respite, an escape. For the indomitable Connie Tily, 80, of Jamesville, the songs are another way of gaining strength. “I don’t like to quit,” she said. She laughs about how she “married the milkman,” referring to John Tily, a guy raised on a dairy farm and her husband of 62 years. And the old times created all the good reasons to be here, now. Don Edwards, too, was thankful for each melody. He worked for decades in local television and radio, before teaching at the S.I. Newhouse School of Public Communications. He and his wife Nancy will celebrate their 60th anniversary this year — which Don described as all the motivation he needs for enduring any discomfort from his treatment. He’ll typically read throughout dialysis, but Mary Sugar’s keyboards add a new element. “Can you imagine the difference it makes in this environment?” asked Don, 82, looking at a roomful of weary, stoic patients. Mary played for more than an hour, then began to pack her gear. Dottie Clark, at about the same time, was unstrapped from the machine. Her husband Bob, she said, would soon arrive to pick her up. Dialysis, for Dottie, has become an old routine, and Bob can look at her face and tell exactly how it went. Sean Kirst is a columnist with The Post-Standard. Email him atskirst@syracuse.com, write to him in care of The Post-Standard, 220 S. Warren St., Syracuse 13202, visit his blog at syracuse.com/kirst or send him a message on Facebook or Twitter. 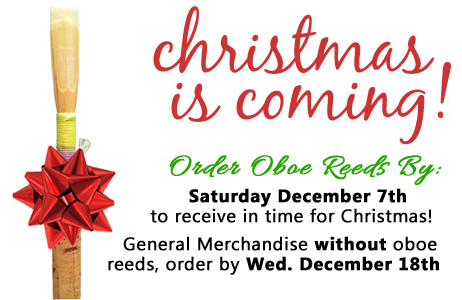 Don’t wait too long to order oboe reeds in time for Christmas! 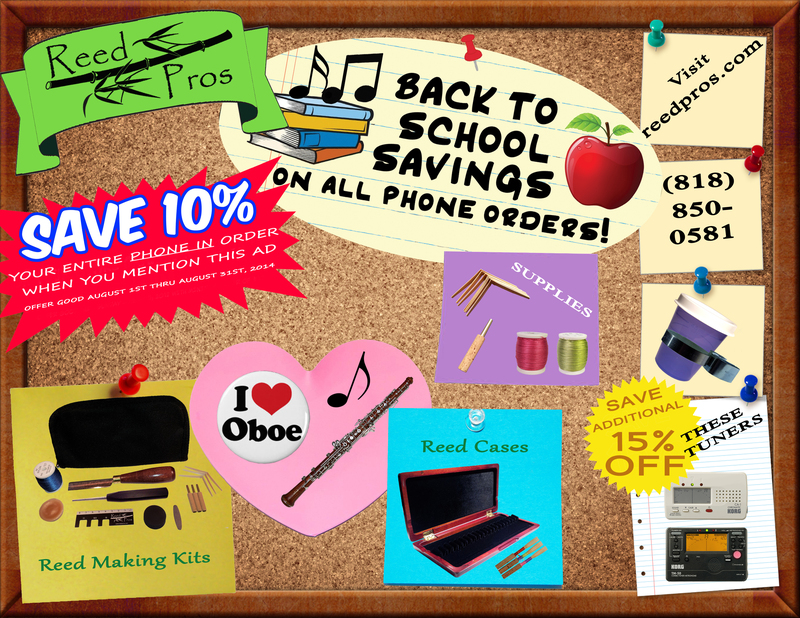 Visit us at www.reedpros.com to see all the latest goodies for the oboist in your life. Here are the key points I make sure I tell my students and their parents about keeping their instrument playing great. 1. Have a silk swab. I have seen many students take apart their instrument and put it away without swabbing it out after playing. Please, please, please make sure you swab it out! It only takes a few seconds and it can make all the difference from preventing sticky keys and keys which get water constantly trapped in them. 2. Don’t drink soda, eat candy or eat food without at LEAST rinsing your mouth out with water before playing. This may seem like I am asking too much but any of that stuff you just put in your mouth is in your saliva which ends up in the instrument. It is even worse for the reeds!! Food particles and sugary spit are the worst culprits for sticky and waterlogged keys. Brushing your teeth would be the best solution but it isn’t always possible. 3. Use cork grease on the joints of the oboe. If you don’t use cork grease, you’ll find your corks will break apart, crumble then fall off then instrument. Cork grease helps the instrument fit together easily which means less aggressive man-handling of the delicate oboe. New corks need more cork grease. You may even have to put it on every time you put the instrument together when the corks are new. 4. Don’t leave an oboe in a hot car. I won’t leave my oboe in the car if I have to go into the grocery store, post office, or some other errand I may have to run on the way home from rehearsal or teaching. If it is 80 degrees outside, it can very easily become 100 degrees inside the car. The heat isn’t a great idea for the wood (or plastic), pads, or corks for your instrument. 5. Don’t leave an oboe in a cold car. I happen to live in a hot climate, but sometimes even here the temperature can get in the 40s. My instrument goes with me everywhere if I have to get out of the car. 6. Never store your oboe in the attic. This doesn’t just apply to oboes. No instrument should ever be stored in the attic. 7. Wooden oboes require extra special care as the wood can develop cracks. If your oboe is made of wood, you should warm it up with your hands or under your arm before playing as well as follow all the other procedures listed here. If you have a brand new wooden oboe, you will need to break it in first in order to prevent cracks. I’ll do a separate post on that another time. 8. Keep the instrument in its case when not in use. 9. Be careful not to squeeze the rods along the side of the instrument when putting it together or taking it apart. 10. Take your instrument to a qualified repairman at least once a year. They will check out the adjustment, oil the rods, replace any leaky pads and replace any damaged corks.